Wicker Park, in front of STITCH (a store having little to do w/ knitting or crochet). Week over yet? What? It just started? But in exchange for the heartbreak we've got the link to our flickr photostream. Add us as a contact and check out our pics. There are some up there that are exclusive to flickr (aka we haven't gotten off our lazy asses to load them up here as normal posts). 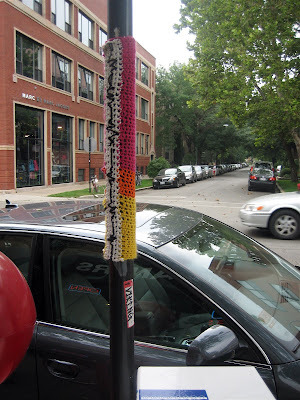 Over the weekend, we also had a great chat with the ladies over at yarn bombing. We had a great time talking all things yarn, craft, and street art. Our spokesperson's roommate even voiced her opinion regarding covering the Picasso sculpture in Daley Plaza. Anyone else think of Jon Lovitz's ego-maniacal Picasso having lunch whenever the artist is mentioned?